The Sandstorm MonstroBot is a Physical type weapon. Encased in metal that has stood the test of extreme weathering and time, the Sandstorm MonstroBot is outfitted with the most advanced technologies. Should a mouse be lucky enough to escape its heat sensor tracking and turbo lasers, they are still left to face its sheer size and hardened fists. One MonstroBot alone could take out three Digby DrillBots at once...easily. Thankfully, its tastes are of the more furry rodent variety! The Sandstorm MonstroBot is not sold by any Trapsmith. It can only be crafted given the proper ingredients. The Sandstorm MonstroBot (if unintentionally smashed) can be reassembled from Sandstorm MonstroBot Parts. Mouse DeathBot - Source of DeathBot Parts for crafting. Digby DrillBot - Source of Digby DrillBot Parts for crafting. RhinoBot - Source of RhinoBot Parts for crafting. Smashing this weapon with the Hunter's Hammer yields Sandstorm MonstroBot Parts. 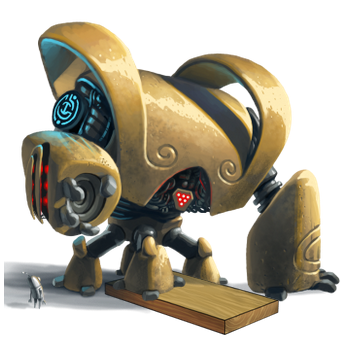 22 March 2011: The Sandstorm MonstroBot was introduced as part of the Fiery Warpath location. 31 March 2011: The first Sandstorm MonstroBot was crafted. The Sandstorm MonstroBot was the first weapon to require a zoomed out view to depict its large size. 7 March 2013: The Sandstorm MonstroBot became smashable.